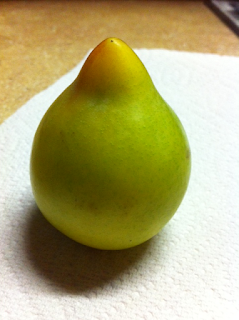 This is a Lemon Plum. I seen these cute little things at a local grocery store and thought Id give it a try. Not knowing anything about them, I bit into it. Was not too thrilled at the taste result. It was not sweet and sorta bitter then left a sour after taste. yuk! If I had googled it before I ate it, I would have known that when they are sold around here, they are usually not ripe and need to sit on the counter for a couple weeks until they are red and ripe. Just a little FYI for anyone wanting to try one. UPDATE: It sat in my window for 3 weeks, turned red, but still tasted yucky and didnt look to pretty on the inside anymore. I do not think we live in a state that these are recommended.